Greetings to the Connecticut Daylily Society from sunny South Carolina! Joe and I are enjoying our new home and climate where winter seemed to last but two weeks. Don’t miss the Avon bears one bit, and although I said I was trading bear for alligator, thankfully I don’t have to worry about them in my yard. We do have some interesting new creatures here though. If you don’t know what a fox squirrel is, look it up. Bizarre looking creatures! And armadillos, though I haven’t seen one yet. We see bluebirds, bald eagles, and lots of other interesting birds. I am battling raccoons, however, nasty creatures who may be living under my screened porch. They come out at night, topple the feeders, bite the tops off my glass hummingbird tubes and leave broken glass for me to pick up in the morning. Until I can figure out a better system, my feeders will be coming in every night! We are beginning to explore the Carolinas. On Sunday Joe and I drove three hours north to visit Charles and Heidi Douglas at Browns Ferry Gardens in Georgetown, SC. It turned out to be their annual Open House weekend, so it was especially fun. The display gardens, the seedling beds and the sales area were impeccably groomed and everything was nicely labeled. Charles had his entire extended family on hand to assist, and a wonderful air-conditioned hospitality building was set up with sandwiches, fruit, desserts and drinks. Southern hospitality, complete with veranda and rocking chairs! Along with their latest introductions, Charles’ earlier introductions and those of Heidi Douglas and Gene Tanner were potted and arranged alphabetically, so it was easy to go from the display beds to finding the plants you just had to have to take home. Another large area was filled with blooming varieties for just $10 per generous pot. I saw lots happy visitors with loaded wagons who were snapping up those beauties! 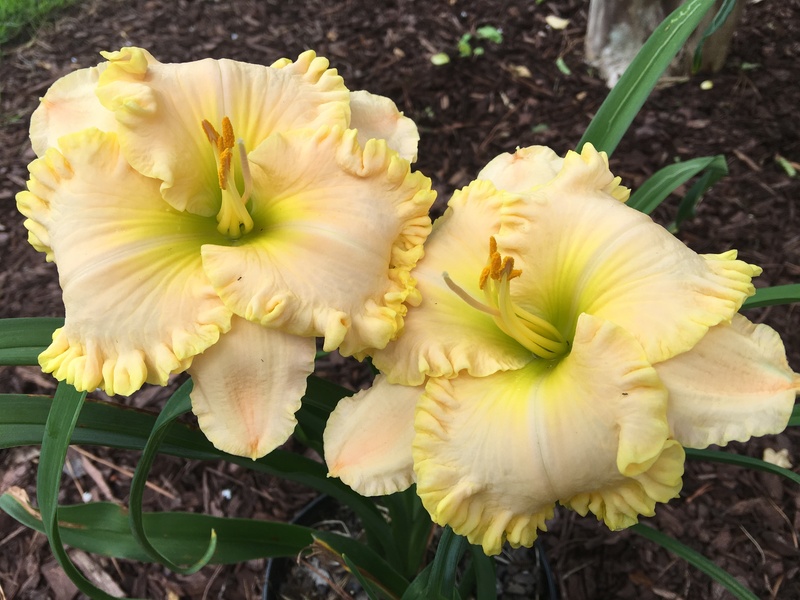 Charles and his family have already begun preparations for the 2018 AHS National Convention when his Georgetown Area Daylily Club will host the convention from June 6-10 at the Myrtle Beach Convention Center in Myrtle Beach, SC. I plan to attend, and hope to see many of my daylily buds there. Charles remembers many of you from his visit to CT some years ago and hopes to see you again in his home state. I can’t wait! As we were on our drive to Browns Ferry we got a call from our oldest son Max, telling us the wonderful news that he had just proposed to his girlfriend of 2 ½ years. We love her already, and I am sure she will NOT be a diva bride, but she is lovely inside and out, like this beautiful flower, and what a fitting way for me to remember this special day! I feel like it has been summer here since April. I got my tomatoes in late yet enjoyed my first cherry tomato “Chocolate Sprinkles” yesterday and am already harvesting and drying mint and basil. It’s a different world here! Linda K has sent me four boxes of my hosta and daylilies so I do feel like I have brought some of my garden with me. It’s all in the ground, and Linda will send the bulk of the plants in the fall so I am holding off buying many plants until I squeeze in all of my treasures in my limited areas. I did buy a couple of gardenia bushes–I couldn’t resist! Love to all at CDS. I miss seeing you, but in my mind you are just around the corner! Best wishes for a wonderful daylily season, and may the deer spare your buds and bloom! Next AHS Convention Photos & More! Tina, great hearing from you with all your new critters! Glad you have found your local daylily supplier too! Thanks, Russ! Browns Ferry daylilies did very well for me in CT. It will be interesting to see how my other CT plants do in SC. So far, my O’Brien hosta are very happy under the shade of a live oak tree. (As a precaution, I have applied deer/critter repellent as advised by neighbors.) Of course I don’t expect much from my daylilies this year; obviously they will need time to adjust to their new soil and climate. Opening each box and finding my ‘old friends’ (fresh and green!) was better than Christmas morning! I am forever grateful to Linda Kozloski for caring for my treasured plants like they were her own and digging and shipping them to me. Such is the depth of the friendships we are blessed to have made within CDS. No easy task for Linda! But having my cherished garden plants here with me, along with all their associated memories, truly makes my new address feel like home.